The Article: NSA Snooping: The War on Terror Is America’s Mania by Klaus Brinkbäumer in Der Spiegel. The Text: America is sick. September 11 left it wounded and unsettled — that’s been obvious for nearly 12 years — but we are only now finding out just how grave the illness really is. The actions of the NSA exposed more than just the telephone conversations and digital lives of many millions of people. The global spying scandal shows that the US has become manic, that it is behaving pathologically, invasively. Its actions are entirely out of proportion to the danger. Since 2005, an average of 23 Americans per year have been killed through terrorism, mostly outside of the US. “More Americans die of falling televisions and other appliances than from terrorism,” writes Nicholas Kristof in the New York Times, and “15 times as many die by falling off ladders.” The US has spent $8 trillion on the military and homeland security since 2001. America has other threats. The true short-term danger is homegrown: More than 30,000 Americans are killed by firearms every year. An American child is 13 times more likely to be shot than a child in another industrialized country. When it comes to combating the problem, President Barack Obama and Congress are doing very little — or, to be fair, nothing at all. They talk about it every now and then, after every killing spree. The gun lobby, incurably ill, counters that the weapons are necessary for self-defense. And when it comes to real long-term dangers, such as climate change, America, its prime perpetrator, does nothing — or, to be fair, too little too late. All of this is not to say that terrorism doesn’t exist: 9/11 happened, and al Qaida is real. But spying on citizens and embassies, on businesses and allies, violates international law. 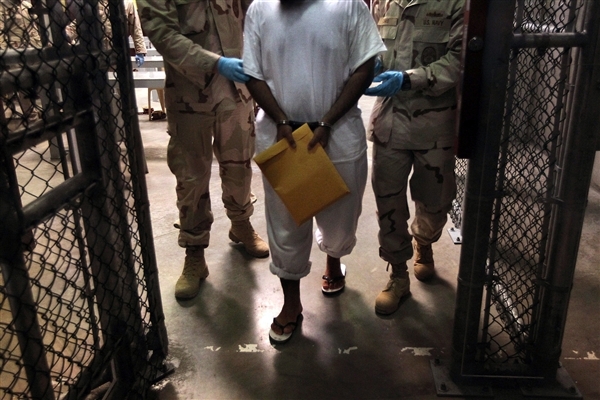 It is as monstrous and as unlawful as Guantanamo Bay, where for 11 and a half years, men have been detained and force-fed, often without evidence against them, many of whom are still there to this day. It is as unlawful as the drones that are killing people, launched with a mere signature from Obama. There has been virtually no political discussion about all of this. Attacks have been prevented through the spying program — Obama says it, German Chancellor Angela Merkel says it, and we have to believe them. Voters and citizens are akin to children, whose parents — the government — know what is best for them. But does the free America that should be defended even still exist, or has it abolished itself through its own defense? An American government that gives its blessing to a program like Prism respects nothing and no one. It acts out its omnipotence, considers itself above international law — certainly on its own territory and even on foreign ground. The fact that it’s Obama behaving in such a way is bleak. If this were happening during the administration of George W. Bush, we could at least think, “It’s just Bush. He’s predictable. There is a better America.” Now we know: There is only one America. Did Obama, the Harvard Law student, even believe what he was saying in his speeches about the return of civil liberties? Can someone be so cynical that they promise to heal the world, then act in such a way all the while giving the xenophobic explanation that only foreigners would be monitored? Martin Luther King and Nelson Mandela are Obama’s role models. What would they say? The German government has shown devastating weakness. Merkel should say, “You are manic, and what you are doing is sick.” That’s what friends do. Instead she weighs every word to avoid annoying the Americans. She said that a comparison between the NSA and the Stasi is inappropriate, but she’s wrong. A comparison doesn’t require that two things be identical. The Stasi destroyed families, the NSA probably not. But the use of technology, the careful nurturing of the image of the enemy, the obsessive collection of data, the belief of being on the right side, the good side: Is there really no resemblance? Angela Merkel promised to defend the German people from harm. To have your phone wiretapped and accept the fact that every one of your emails could be monitored — the violation of the private sphere — that qualifies as harm. Lets be truthful. Merkel is interested in financial markets not human rights or civil liberties. She is a chubbier version of Thatcher. Her and the rest of her gang of neoliberal cronies and gangsters need to go. Western society is anomic and the cause is the rise of multinational corporations – whose power goes unchecked and is so toxic that they are destroying the very foundations of law and democracy. Yes 9/11 happened and Al Qaeda exists in the same capacity that an idea exists. However, lets put everything into proportion. It is statistically proven that the average person in the West stands a better chance of getting killed by a meteor from outer space than a terrorist act. The trillion dollar war on terror and its police state is a highly orchestrated and politicized overreaction intent on social control and the construction of an economy based on fear. We have gone from economies of scale to speed…to crisis. Fear, security and risk are the new currency. Our greatest threat is not the unseen terrorist but the large corporations that terrorize us by destroying our livelihood, poisoning our water, air and earth, spying on us, enslaving the populations of the developing world, rigging the financial markets and sabotaging sovereign determination. The greatest ills in society can be connected to the post war rise in the multinational corporation.